Online offer only. Prices are valid on travel from 01 February - 31 December 2019. Must book by 30 April 2019. Rates may be higher during holidays and special events. 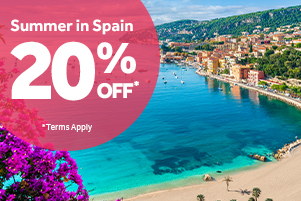 Promotion applies to participating European destinations only. All accommodations are subject to availability. Full payment for the accommodation must be made at the time of booking. A credit/debit card processing fee may apply. If you cancel your reservation no refund will be due. A maximum of sixty (60) nights can be booked with this offer. Rates listed are per night. Transportation, taxes and all other incidental charges are not included. Other restrictions may apply. 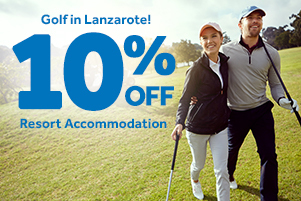 For more information, please call our European reservations team on +44 (0)800 358 6991 or our U.S. reservations team on 1.888.990.9569 and mention code GOLFLANZA. Club del Carmen is the most popular resort on Lanzarote, Spain, and is ideally situated only two minutes away from some of the most beautiful beaches in the world, including Playa Grande and Playa Chica, where you will be able to take part in a number of water sports. Try diving and snorkeling, and if you are daring enough, you may even want to try using jet skis or even explore parasailing just 70 miles off the coast of Africa. There are so many things to see and do in Lanzarote, and you can do many of them right at Club del Carmen. If you love to shop, there is plenty of great shopping in the area, as well as a beautiful gift shop located right at the resort. On-site activities include swimming in the beautiful heated outdoor pool, and the kids can play in the children's outdoor pool. There is also an outdoor whirlpool where you can just sit back and relax. Play table tennis, or rent a moped/scooter and take a fun tour of the countryside. There are different types of accommodations at Club del Carmen, and each can house at least four people, so you can easily enjoy a family vacation, and only have to rent one room for your stay. The one bedroom apartments can sleep four people comfortably, and the two bedroom apartments and villas sleep as many as six people. Cots can be brought in upon request if you need additional sleeping space. Each room comes complete with a full kitchen. Now, we know that the last thing you probably want is to cook while you are on vacation, but if you want to fix yourself a snack at night, or you want to make your own healthy meals instead of eating out, you have that option available to you. The large, full bathrooms include a complimentary toiletries kit, and each room has televisions and DVD players. There are also wheelchair accessible accommodations available on request. Whether you are looking for a vacation that is loaded with fun and exciting adventures for the entire family, or you just want to get away from it all for a while, you can find what you are looking for at Club del Carmen. Book your vacation today, and don't forget to bring along plenty of sun block for your outdoor adventures.